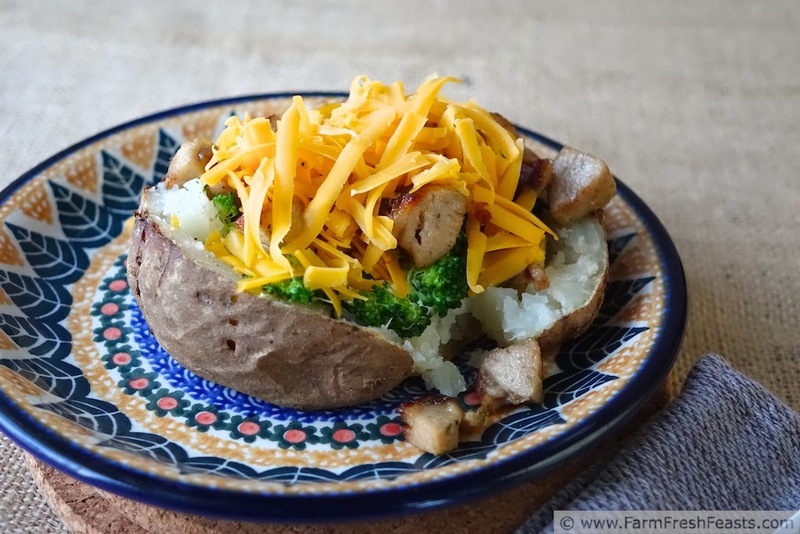 A seasonal topping for a St Patrick's day supper, this simple meal consists of sausages braised in Stout coupled with fresh broccoli and a baked potato, covered in cheese. I made this as a simple 'use what we've got from the fridge/pantry' supper. 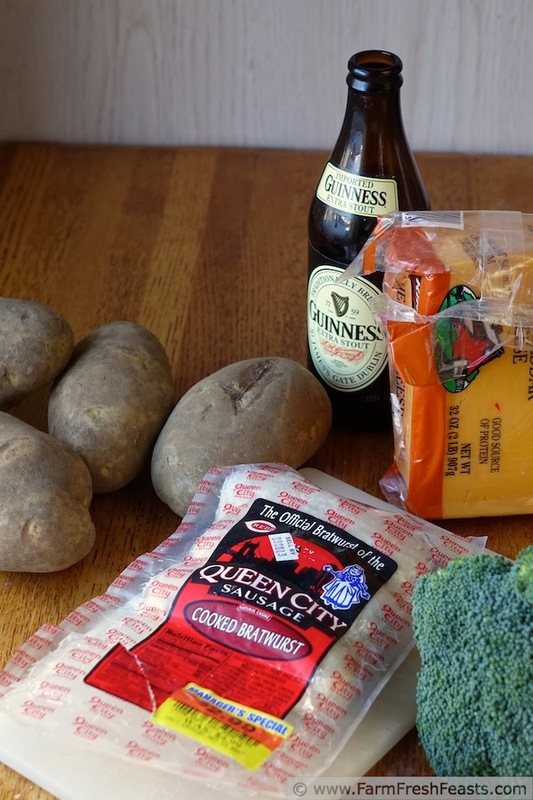 As I thought more about what I wanted to write for March/St Patrick's day I realized this simple meal would make an excellent alternative to a more traditional bill of fare. I mean, I love corned beef and cabbage, especially in the form of New England Boiled Dinner, but I dislike eating it when the marketing hype tells me to do so. Don't get me wrong--in March I love to buy cabbage and potatoes on sale, and at the end of the post I'll share some other cabbage recipes--I just don't like being told when to eat things. If you want to go rogue for St Patrick's day (heck, I'm not even Irish) join me. This starts, as do all good Irish tales, with a bottle of Guinness. I confess the only time I've actually relished a glass of Guinness was in a pub in Ireland--possibly in Baltimore but I'm not 100% sure which town, though of my time in Ireland, Baltimore and the Dingle peninsula was my favorite area. For more recipes using broccoli, please see my Broccoli Recipes Collection. For more recipes using potatoes, please see my Potato Recipes Collection. These collections are part of the Visual Recipe Index by Ingredient, a resource for folks like me scrambling around in March trying to keep eating seasonally and locally and running out of fresh food and freezer inspiration. I'm sharing more recipes on Pinterest, follow me there. If you like good reads, I share articles that catch my eye on my Facebook page, follow me there. If you like a good peek behind the scenes as much as I do, follow me on Instagram. Want to know How to Use This Blog? Note--I microwaved my broccoli. I probably should have roasted it, seeing as I had the oven on anyway, but this post on roasting broccoli wasn't on my mental radar screen. Final note--do you like crispy baked potato skins with creamy potato insides? Alyssa has a tutorial for Perfect Baked Potatoes at Everyday Maven. Do check it out. Place potatoes on rack and bake until they give when you reach your OveGloved hand in and squeeze them, about 45 minutes to an hour depending on the size of the potatoes. After the potatoes have been baking for about half an hour, place 1 cup Guinness in a skillet and add bratwurst links (1 per person or less if you prefer to eat less meat per meal). Simmer over medium heat for 10-15 minutes, turning occasionally, until fully cooked. Drain skillet, chop bratwurst into bite-sized pieces, and return to skillet to crisp up, another 5 minutes. Set aside. Cook broccoli (I nuked mine on High power for 3 minutes with a splash of water, but as I wrote above I think roasting would be an excellent idea too). 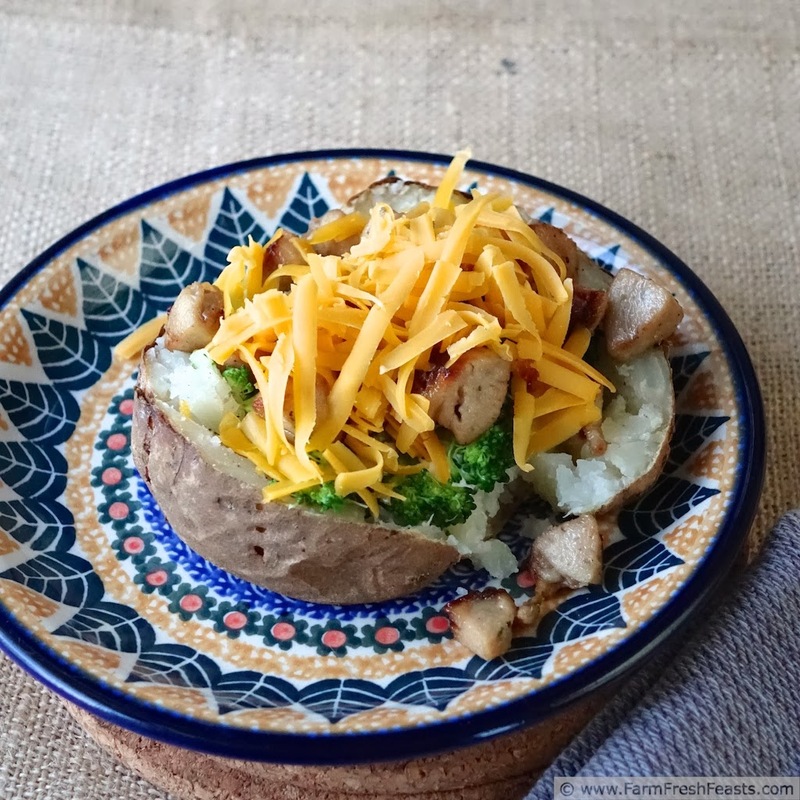 To assemble, fill the baked potato with brats and broccoli and top with cheese. Serve with additional Guinness if you're old enough to drink it. This looks so delicious. Thank you for posting. It's such a simple recipe I nearly opted to throw it in the cast of pile, but I did think it looked pretty and fresh and green and . . . well seasonal. Thanks! Wow! This looks like a dream dinner for me. I'll keep my eye out for some brats. Perfect for St. Paddy's Day! Thanks for not telling me I had to be traditional for St Patrick's Day! All good Irish tales do start in a bar with a pint of Guiness. 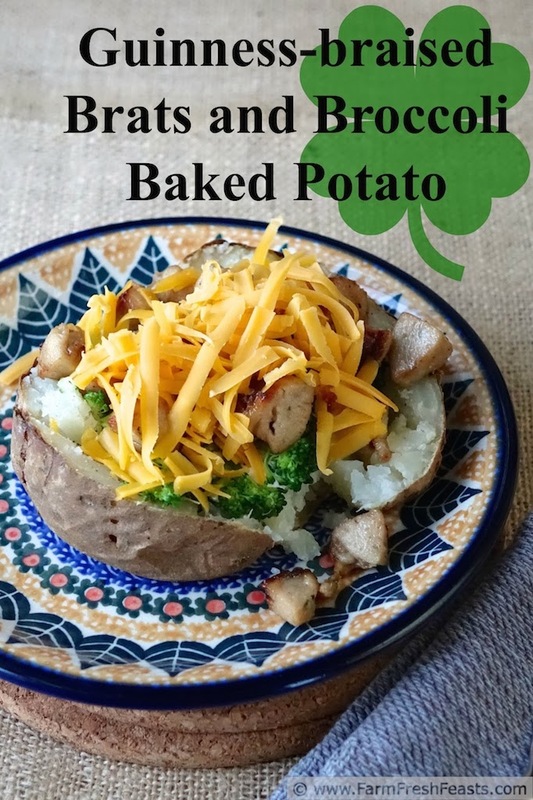 This is a great idea, especially since I've been on a huge baked potato kick lately. I love the idea of stuffing them with broccoli and cheese. I was actually thinking about stuffing my next one with my leftover Cauliflower Chickpea Tikka Masala dish. It could be really interesting, although I'd probably eat potatoes any which way I can get them. I suppose that's my Irish showing. Stuffing baked potatoes with anything tasty sounds good to me. I think I need to snag some more potatoes now. Thanks! Potatoes, brats, broccoli, beer... Topped with cheese? I will be saving this one for sure! What's not to like? Well, the lack of True Irishness, I suppose. I could have used Irish cheddar (just saw a bunch at the grocery store) to make it more . . . green. Thanks! I loooooove brats and this meal looks SO awesome to me. YUM! I'm delighted with the positive response for my 'going rogue' with respect to St Patrick's day. Thanks for the invite--I love link ups! What a great combo, brats and potatoes go so well together! Thanks for sharing at Simple Supper Tuesday. I'm a fan of the simple (which sounds weird because I like to make my own pizza, but after you've got all the routines down it really is simple). Thanks! Stopping by through the "From the Farm" blog hop and my non Blogger blog, yumeating.com. I've been doing Irish recipes all month for March/St. Patrick's Day. So far most of them have been traditional. But, I have the rest of the month to go! I'm completely impressed with your recipe. I've never thought about cooking my sausage in Guinness and then putting it on top of my baked potato. Genius! 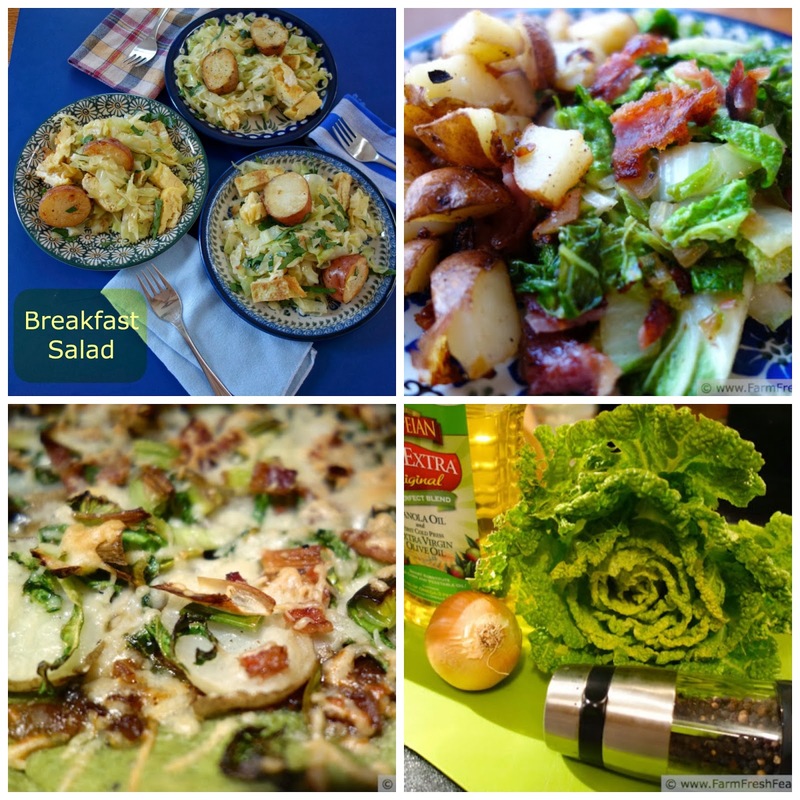 What a great idea to have a month of Irish recipes--well done! I admit I like to buck tradition now and again (and again and again) though I've got a corned beef, cabbage, and potato idea for a pizza, so perhaps that will be a more traditional recipe next time.